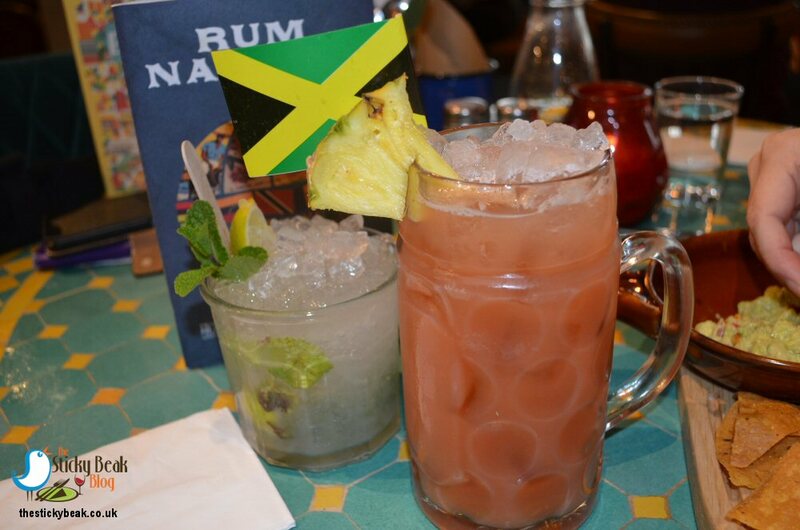 Wey aye pet, Revolucion de Cuba has hit the Toon!! 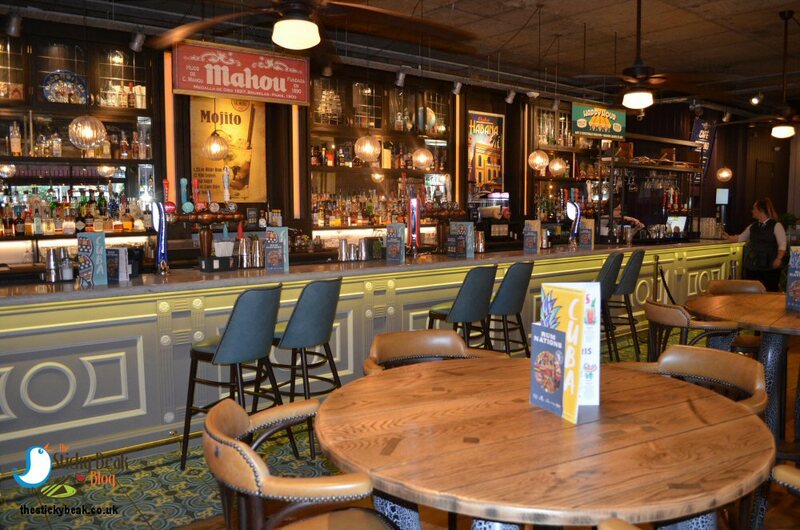 A few weeks ago the brilliant Revolucion de Cuba (RDC) added another feather in their cap and opened their latest venue in Newcastle city centre - and what a fab job they’ve done I must say. 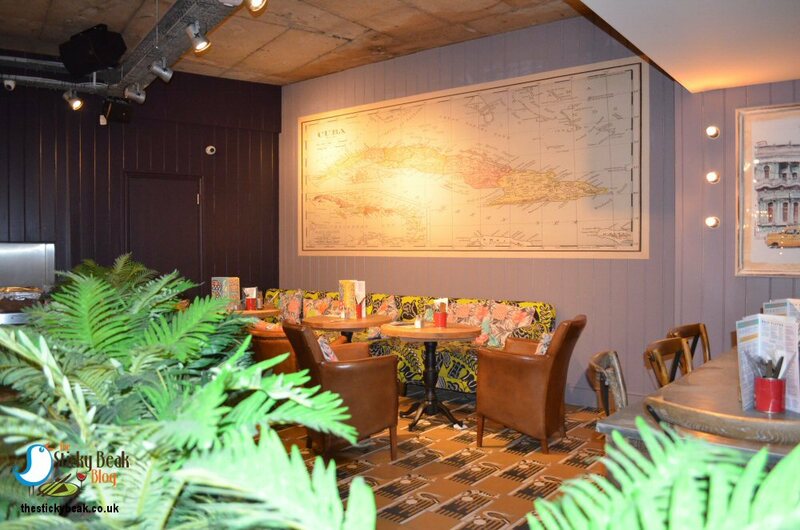 Now, Derby has the most amazing high ceilings in its premises that allow it to have neon “Cuba” signs and a massive map of the island itself on display, and nowhere is going to be able to compete with that. Credit where it’s due though – the Geordies have got a rather swanky drinks terrace up on the third floor that affords you great views of the city and the hustle and bustle of the streets below. 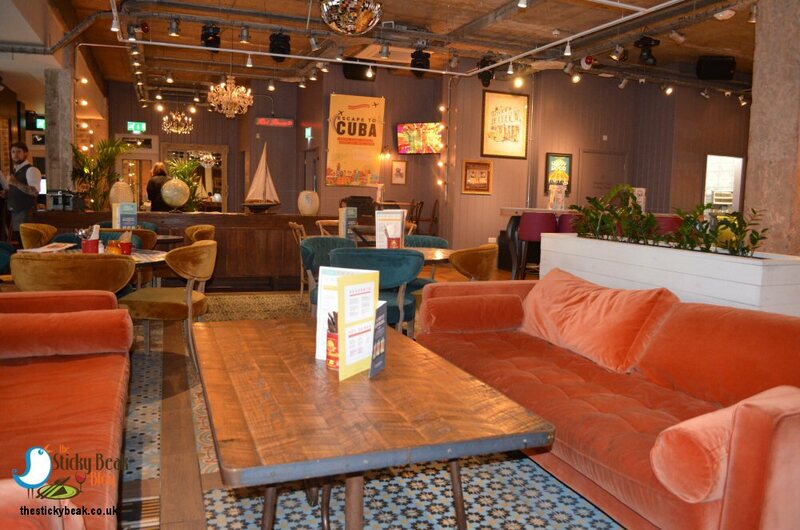 I was pleased to see the disco mirror balls in evidence, as well as the eclectic, vibrantly coloured seating and scatter cushions; RDC has its own style that signals good times ahoy. 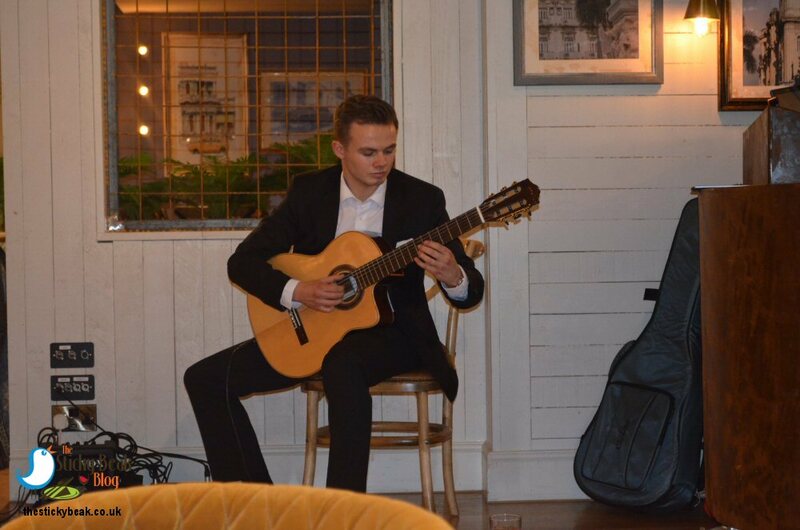 On the evening His Nibs and I visited there was a guy playing acoustic guitar at the top of the dining section, so that was setting the chilled-but-happy vibe that RDC is known for. Jamie was our host-with-the-most server for the evening and soon got us sorted out with Reggae Rum Punch, Classic Mojito and a basket of complimentary nachos. As we nibbled away and decided what we fancied, Jamie nipped off and fetched a jug of iced water for us, complete with Lemon slices. They always say that like attracts like don’t they? Perhaps it was no surprise then that Jamie is a fellow self-confessed foodaholic; why did I have a feeling that my waistline was going to get a battering?! 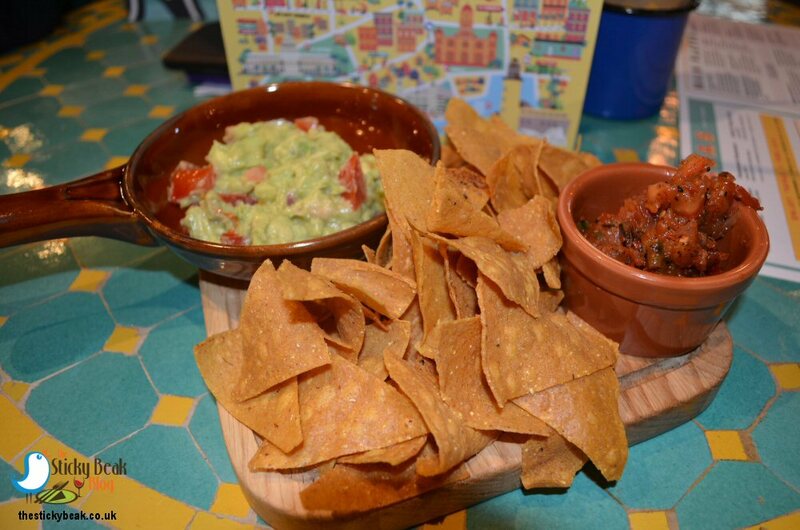 I have no idea how it happened, well I do – Jamie, but a plate of nachos, RDCs stonkingly good Guacamole and Smoky Tomato Salsa was soon at our table being gobbled up like there was no tomorrow! It was blooming good though – that Guac is to die for. The Man Bird and I ordered 4 Tapas dishes between us as a starter: Chorizo Croquetas, Beef Fillet Skewers, Chicken Quesadilla, and Mojito Prawns. I have to have either the Mojito Prawns or Gambas Pil Pil every time I go to RDC, they are just too good not to have. 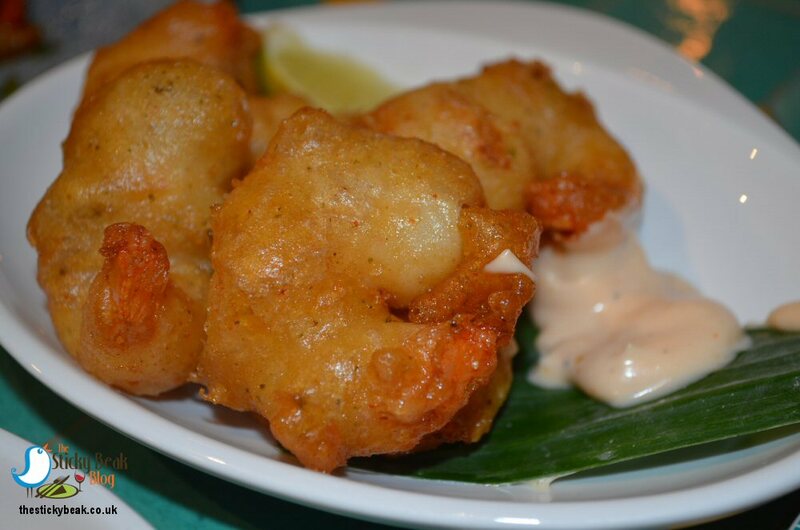 The Mojito Prawns are coated in a super-light batter (almost Tempura grade, I would say) that has a lovely whisper of Mint to it – and the Prawns themselves are deliciously juicy and flavoursome. His Nibs was busy attacking the Chorizo Croquetas and was clearly enjoying the mini morsels. 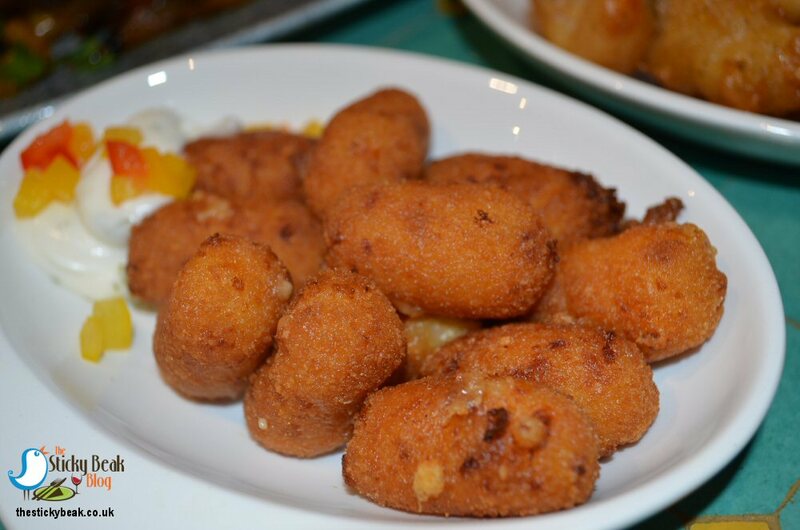 They were lovely and creamy textured inside, with a gorgeous smoky Chorizo taste. The outers yielded a lovely gentle crunch when bitten into and chewed, so the contrast was nice for the senses to appreciate. Punchy Garlic Aioli was a great partner for these little temptresses, and we both said how superb they were. 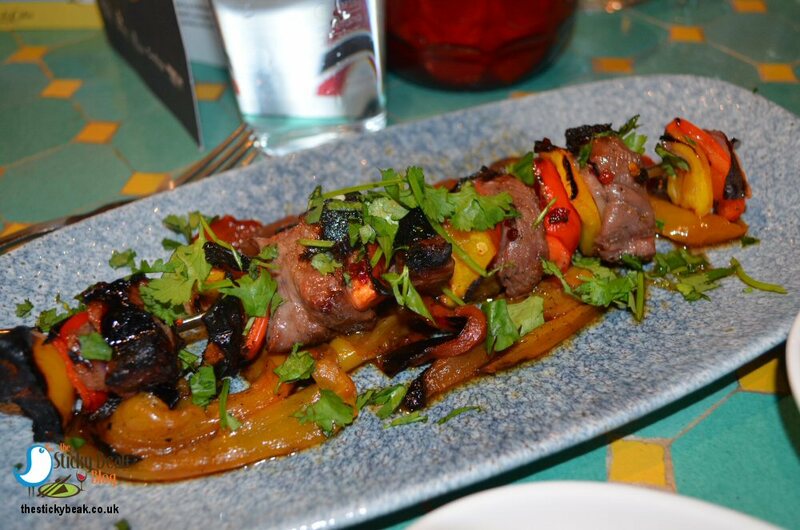 A tangy Chilli Jam coats the strips of Beef Fillet, Peppers, and Onions as they’re being cooked, and it really does bring a great spicy note to the dish. The beef was tender-as-you-like and beautifully moist in the mouth, and the vegetables were still crunchy to give the mouth some substance to bite on. On the bottom of the metal skillet that this dish comes on is a bed of sautéed onions and peppers; the smokiness of these was simply divine and went jolly nicely with the Chilli Jam’s spiciness. 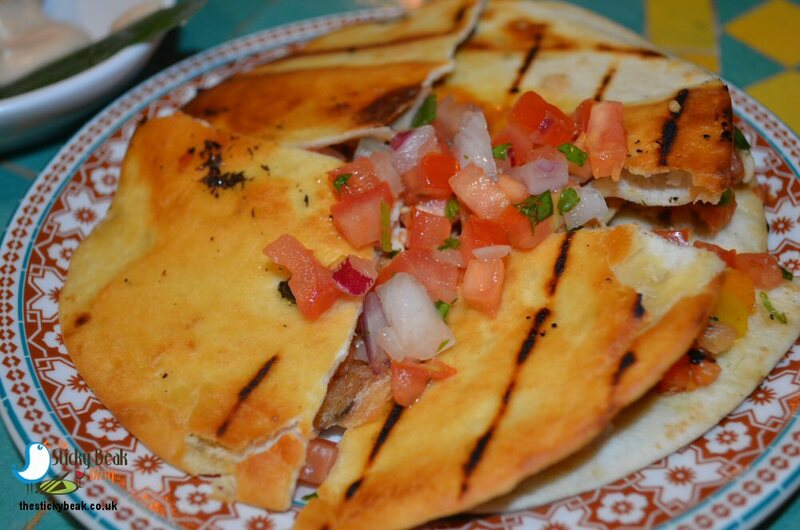 Crispy grilled tortilla triangles filled with Chicken, onion, peppers and cheese form the Quesadillas and then more cheese is melted on top and Pico de Gallo added. The net result is total Tapas heaven! These make a great, light-on-the-tum nibble that any meat eater will appreciate. Jamie had popped back a couple of times to check that everything was ok with our food and drinks, so he wasn’t too shocked when four empty Tapas plates went back to the kitchen. 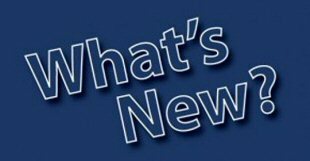 He asked us what we’d been up to, and when we said that we’re from Derbyshire and were up visiting relatives, he came up with a whole raft of touristy places and things to do. Talk about going above and beyond with customer service - what a champion! 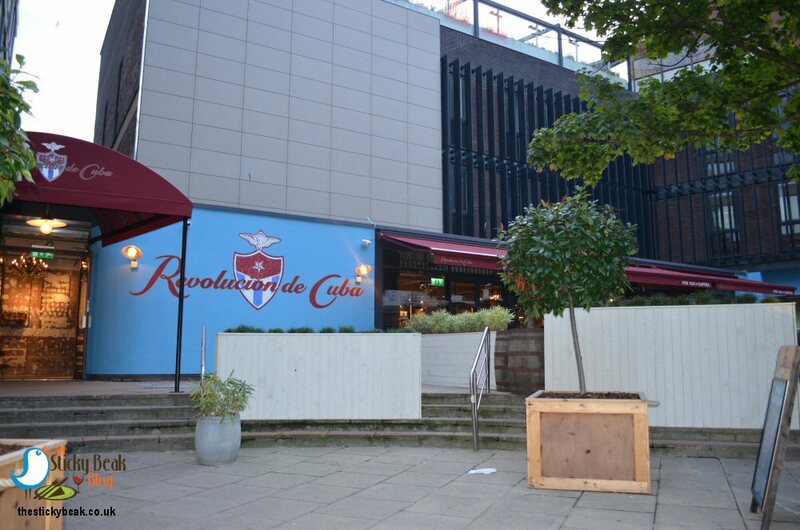 With this particular Revolucion de Cuba still being in its infancy, we asked Jamie what dishes he really rated. One thing about foodies is that they’re not shy about experimenting with food; Jamie will pair the Paella de Cuba with the Roasted Chorizo (one of the Tapas items), and was going in some depth about what he likes about doing that – which provided me with a bit of inspo. 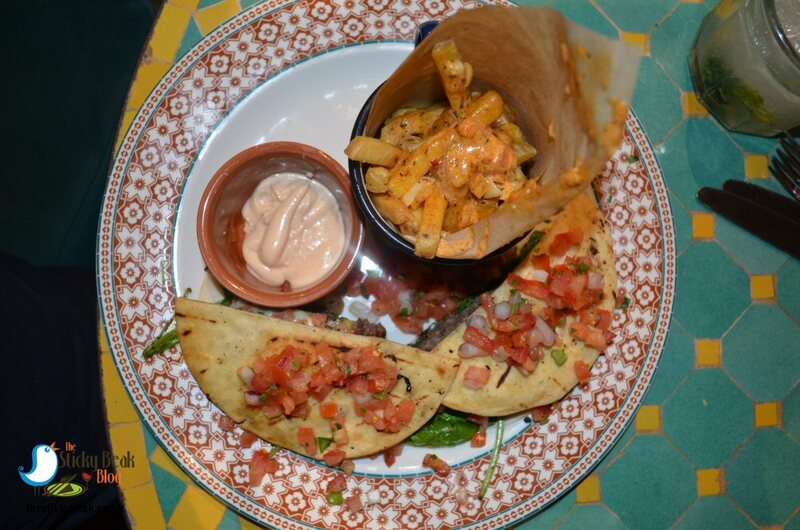 I chose the Paella de Cuba as my main dish and ordered the Creole Sweetcorn for a side; The Man had the Quesadilla burger with a side of Cajun Cream Fries. The Paella was a real meat feast, packed with whopping King Prawns, large cubes of Chorizo, and chunks of marinated Chicken. A seemingly never-ending bowl of spicy rice, onions, peas, and peppers provided the playground in which the meat hid. All the meat and seafood in the Paella was excellent; cooked properly and moist in the mouth. I also had a few forkfuls of the Creole Rice in its natural state before my little experiment and it was ruddy fab. The Sweetcorn kernels were cooked with micro-finely chopped onion and peppers and then tossed with honey, spiced Creole butter, Chilli, and Coriander, and the taste explosion on the palate was incredible. So how can it get better, you ask? 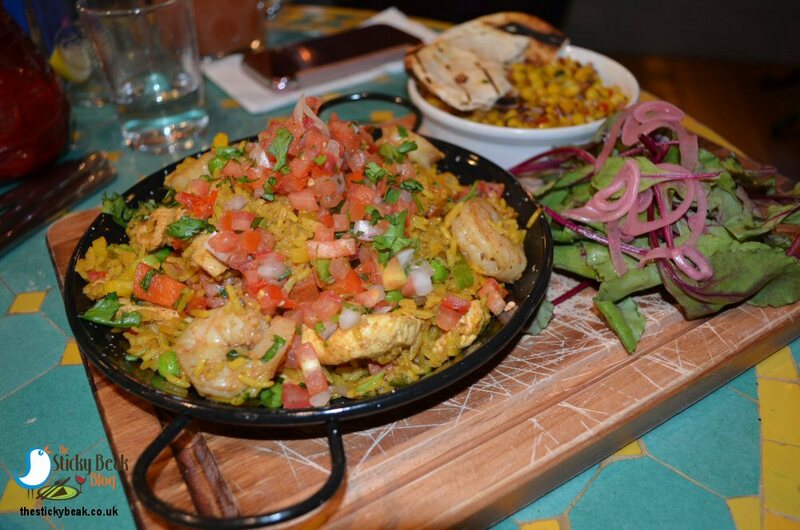 I decided to create my own Paella de Sticky Beak by clopping the Creole Rice into the Paella de Cuba – utter genius. The spiciness, smokiness and sweetness all fused together in harmony and the creamy butter gave it that marvellous “comfort food” factor. Knockout. Jamie was impressed by my spontaneity, the hard-working Chef probably less so! Across the table, The Boy Wonder was munching away happily a beef patty that is quite possibly the biggest known to mankind – with a taste to match. RDC hand press their burger patties: by the way, I should just say that you can add further burgers to the single patty if you so wish (Jamie does!). Both Mozzarella and Chilli cheeses are piled on top of the meat, along with wilted Spinach, Tomato, and a slice of Serrano Ham. 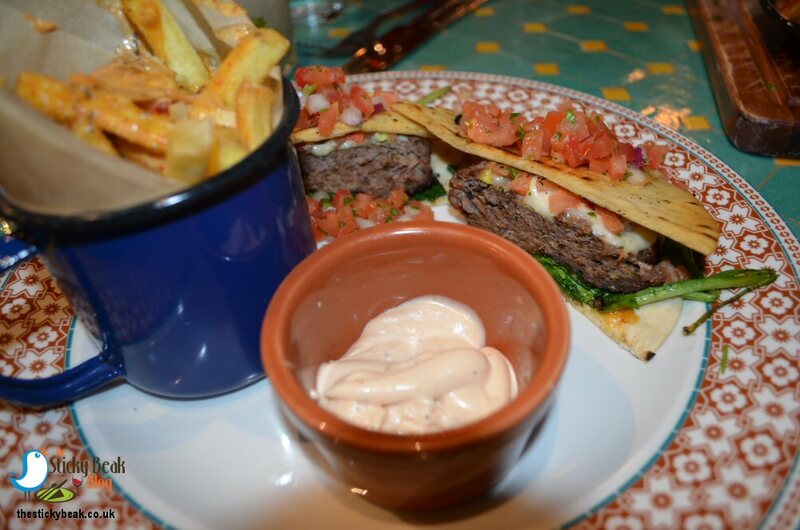 As homage to the Cuban inspired cuisine they serve, RDC envelop their burger with a Quesadilla instead of a bread bun and top it all with fresh Pico de Gallo. Normally the Quesadilla Burger comes with Rum Mayo and Fries as standard, but Jamie suggested upgrading to the Cajun Cream Fries so that’s what His Nibs did. Dirty fries are just THE best; The Man and I have topped chips with all sorts of stuff over the years: gravy or cheddar at school, and Garlic sauce or chilli sauce at the kebab joints close to nightclubs in our younger days. The Cajun Cream at RDC is phenomenal though when paired with humble skin-on fries; it has a creamy note that kinda sinks in to the fries, then a spicy kick wakes your taste buds up! Sometimes you’ve got to be a bit filthy. 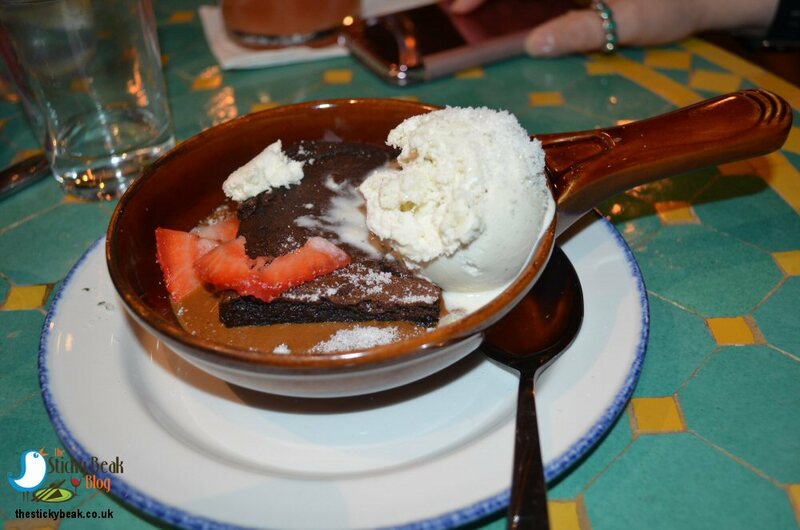 Normal folk would be waving the white flag of surrender by now, but not us pair of gluttons; that’ll be Chocolate Brownie and Churros for pud then please! There’s no wonder I’m a frequent visitor to my local gym! The Brownie is so worth it though, with all its soft gooey, velvetiness. I love the depth of Chocolate hit that you get with this particular Brownie, it needs to be substantial to stand alongside the rich Salted Caramel sauce that comes with it. The Vanilla pod ice cream was like silk in my mouth and had a lovely rounded taste to it. I saw it written somewhere that “nothing tastes as good as skinny feels; except doughnuts - they taste like skinny can go f*** itself”. Now to my mind Churros are the Spanish equivalent of doughnuts, so as I pinched one off His Nibs that’s the thought that ran through my mind! 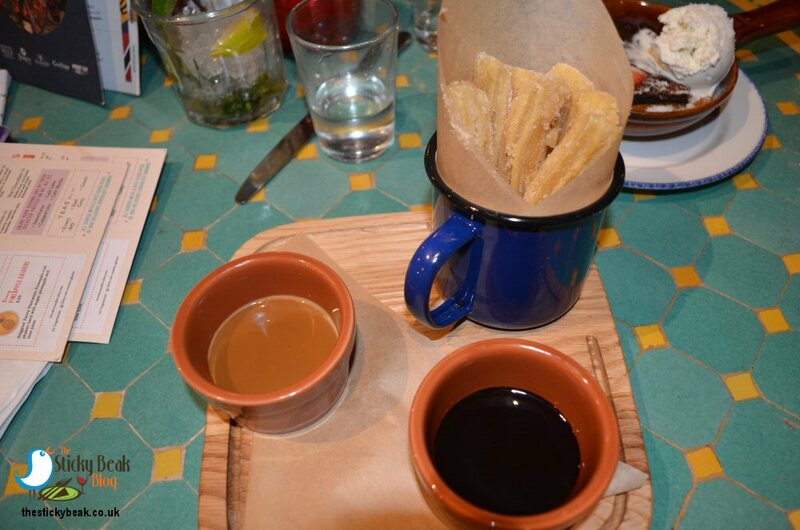 Revolucion de Cuba smother their Churros in delicious Cinnamon Sugar and they aren’t stingy with it, so you get that great spice hit too as well as sweetness. There is a pot each of warm Chocolate and Salted Caramel sauces in which to dunk these doughnut fingers. You can dip them in singly - but let me tell you, a double dip is just beyond! We ordered our usual black coffees to finish the meal, and squealed with delight as we saw the squares of Brownie that come with them. I know, it’s the small things. 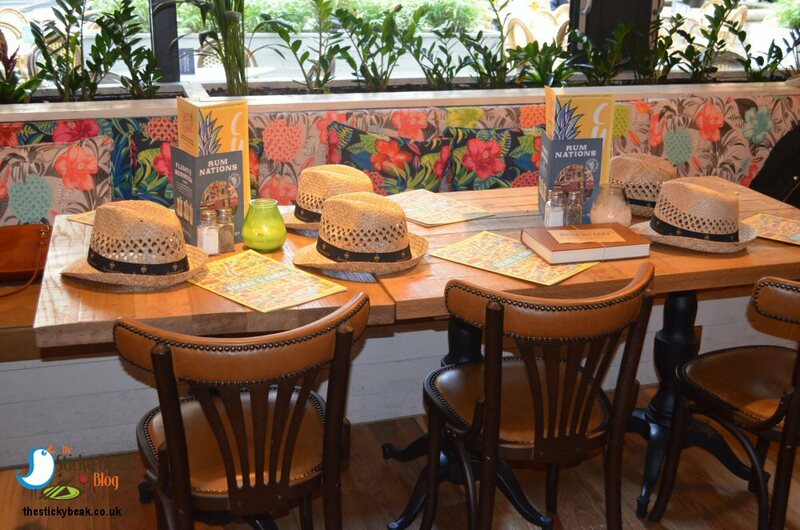 Despite it being the Tuesday after Bank Holiday Monday there was still plenty of folk dining in Revolucion de Cuba, so there was a lovely buzz about the place to say it has only been open a few weeks. In respect to Newcastle I shall say “Howay” to Revolucion de Cuba rather than my usual “Hot Wings” - but the sentiment is the same. Great Job guys! !